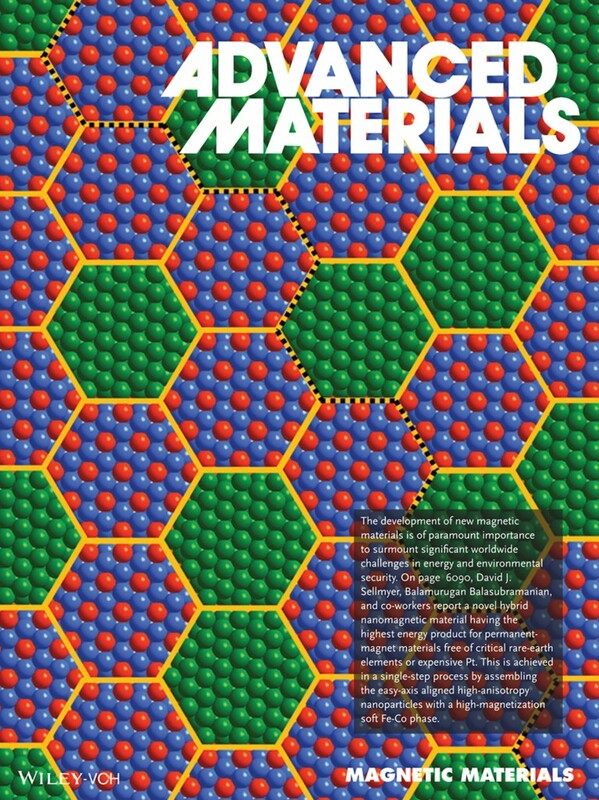 On the Cover: The development of new magnetic materials is of paramount importance to surmount significant worldwide challenges in energy and environmental security. On page 6090, David J. Sellmyer, Balamurugan Balasubramanian, and co-workers report a novel hybrid nanomagnetic material having the highest energy product for permanentmagnet materials free of critical rare-earth elements or expensive Pt. This is achieved in a single-step process by assembling the easy-axis aligned high-anisotropy nanoparticles with a high-magnetization soft Fe-Co phase. David Sellmyer and Balamurugan Balasubramanian, November 13, 2013. Magnetic Materials: Novel Nanostructured Rare-Earth-Free Magnetic Materials with High Energy Products. Advanced Materials 25(42), p.6089. David Sellmyer is director of the Nebraska Center for Materials and Nanoscience and George Holmes University Distinguished Professor of Physics and Astronomy. Balamurugan Balasubramanian is a postdoctoral research associate in the Nebraska Center for Materials and Nanoscience.